Buffy is back. Three words that are sure to get you excited for the new year. One of the most influential TV shows of all time got five extra seasons to continue the story thanks to Dark Horse’s comic series, but now it’s time for a fresh start. The Scooby Gang has landed at BOOM! Studios with an all-new ongoing series set to relaunch the entire Buffyverse. 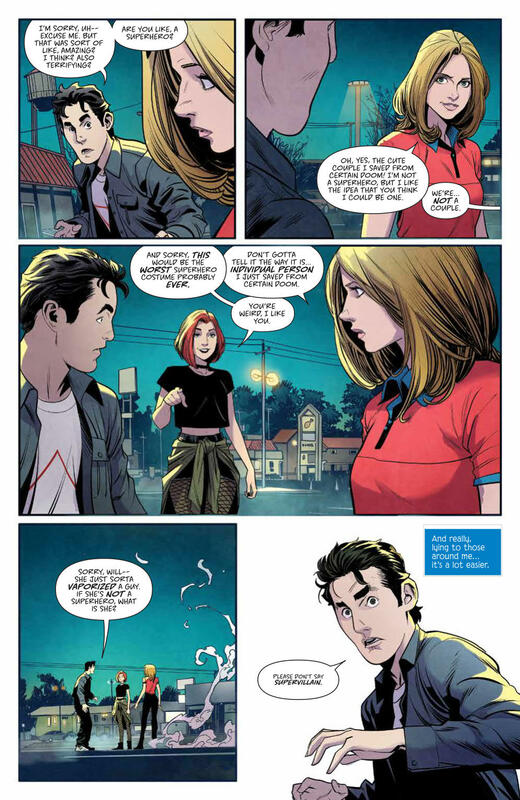 After the jump, check out my full review of the first issue of the all-new Buffy the Vampire Slayer. Disclaimer: I received a copy of Buffy the Vampire Slayer #1 courtesy of BOOM! Studios. Go back to the beginning as the critically acclaimed pop culture phenomenon Buffy The Vampire Slayer is reimagined under the guidance of series creator Joss Whedon. This is the Buffy Summers you know, the chosen one who just wants to be a normal teenager. Jordie Bellaire (Redlands) and Dan Mora (Go Go Power Rangers) bring Buffy into a new era with new challenges, new friends...and a few enemies you might already recognize. Welcome back to the Hellmouth. I discovered Buffy in college and fell in love with the entire supernatural universe created by Joss Whedon. I read a season or two of the comic continuation, but the near unlimited budget of the comics medium created some pretty whack storylines. When I heard BOOM! Studios, the same publisher that rebooted Power Rangers into the modern age, had gotten ahold of my favorite vampire slayer, I knew we were in for something special. Not only does this new series bring the 90s show ankle deep into the 21st century, major story elements are changed around. In fact, this entire first issue is a completely original story with characters pulled from across the Buffyverse. 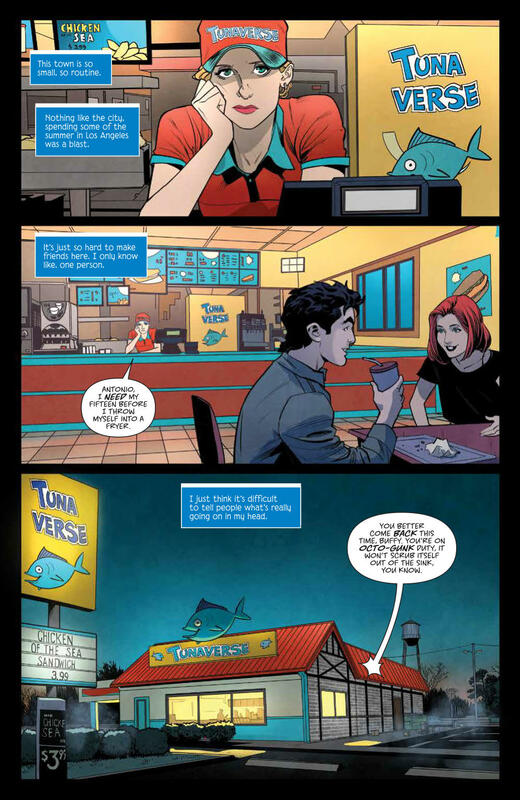 We open at Buffy’s part-time job, where she meets Xander and Willow for the first time - slaying along the way - and right away every panel on the page is familiar and refreshing all at the same time. Bellaire truly captures the distinct voices of these characters, and Mora’s artwork looks more like the original actors than the previous series ever did. Yet we’re not just retreading old ground. The characters still feel as new as if they were created today. Promotional materials for this relaunch have been left intentionally mysterious and vague - variant covers have been all over the place and preview pages didn’t even have finished lettering - so there is still a lot we don’t know about who or what will make an appearance. With Xander, Willow, and Giles on the team, Buffy’s kooky quartet is of course present. But Angel and Cordelia have yet to make an appearance and season one big bad Master is nowhere in sight. 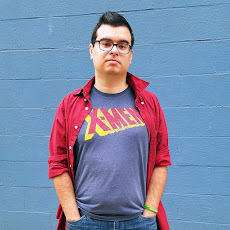 Instead, there are a few appearances by characters, both good and evil, from Buffy’s future. Already revealed by BOOM! are reimagined versions of Season 2’s Drusila, Spike’s mad lover, and Season 7’s Robin Wood, son of a 1970s slayer. One surprise appearance, that I won’t reveal here, shocked me and has me very curious for where the story is going. This new Buffy is exactly the kind of relaunch I love. Everything is the same, but different. We’re back at Sunnydale High, but this isn’t just a retelling of Whedon’s original stories. 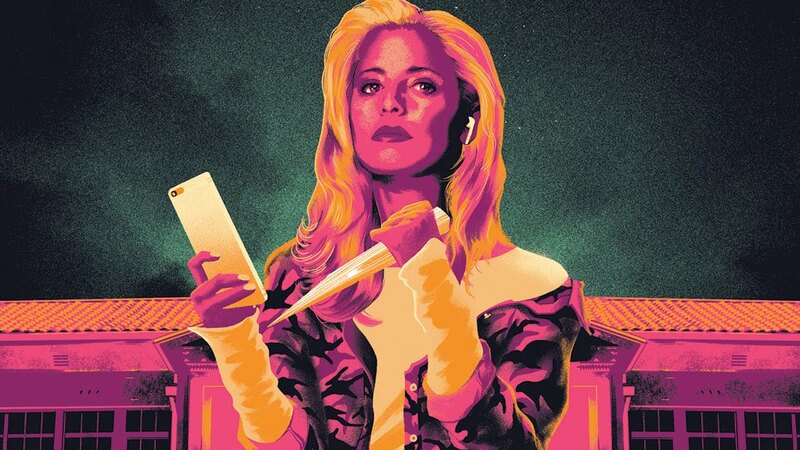 It’s a reimagining that pulls from across the canon to bring us a whole new Buffy, and this new Buffy is exactly what we need in 2019.